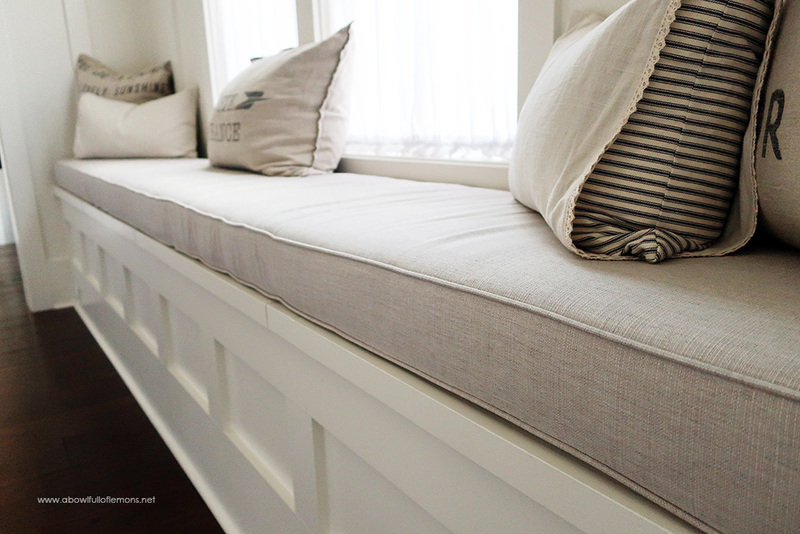 When designing our new home, a window seat was on the top of my list. I had visions in my head and knew exactly how I wanted it to look. We placed it in our keeping room (family room) on the narrow window wall. It turned out better than I imagined. Once the seat was built, I took all of the measurements I needed and went over to Patio Lane to design our seat cushion. I designed our cushion with the custom indoor/outdoor cushion builder. It was simple to create and there were thousands of swatches to choose from. I ordered sample swatches to be sure the fabric would match the style we were going for. In the end, I choose the Sunbrella Echo Ash fabric. I needed it to be able to stand up to everyday use, including pet traffic. So far, it has past the test. 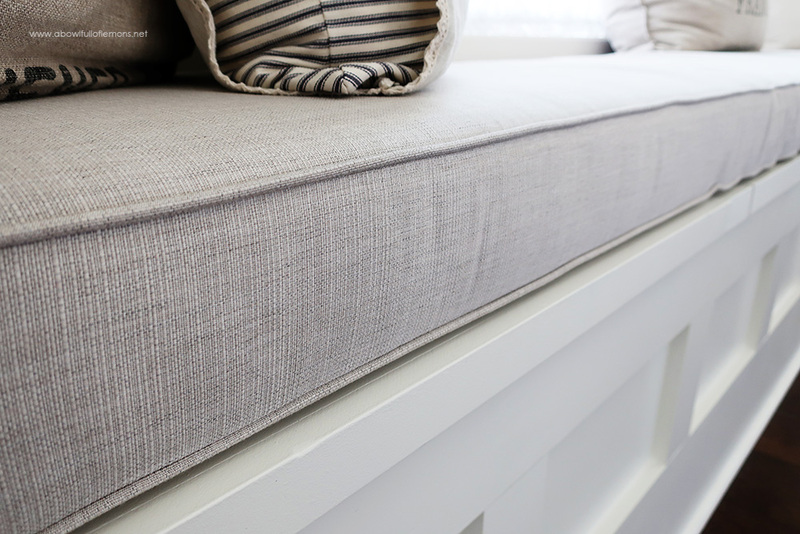 Sunbrella upholstery is water repellent, bleach cleanable and fade resistant, yet incredibly soft to the touch. 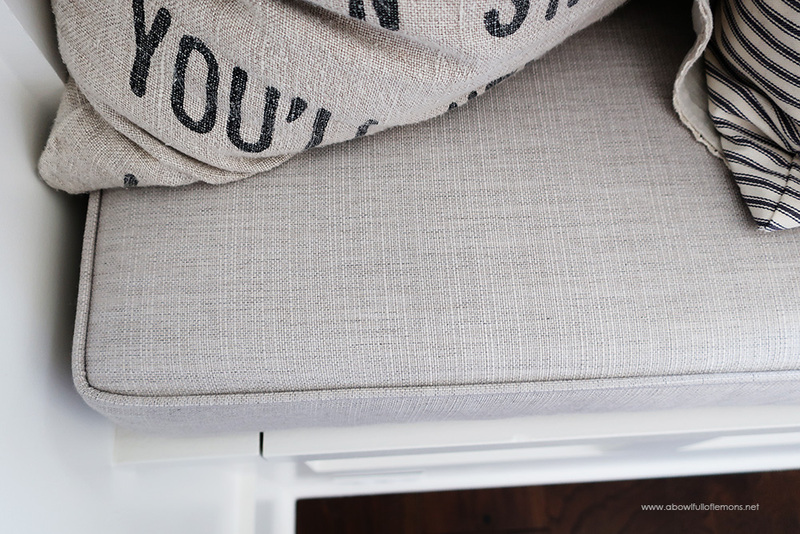 You can also choose rounded corners in the front of the cushion, for a softer touch. 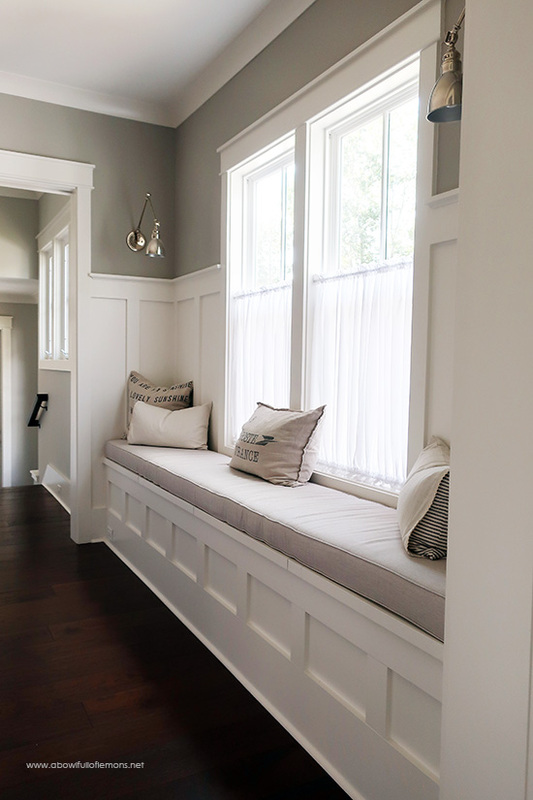 We love our new window seat (and so do the pets). It adds a distinctive cozy feel to the space. PS. The large word pillows are from Sugarboo Designs and the ticking pillows are from Farmhouse Supply. Disclaimer: I partnered with Patio Lane to create this content for you. All opinions are my own & I only recommend products or services I use personally and believe my readers will enjoy. I am disclosing this in accordance with the Federal Trade Commission’s 16 CFR, Part 255: “Guides Concerning the Use of Endorsements and Testimonials in Advertising. Please click here for full disclaimer.